Can’t fall asleep? Has the flu been troubling you for a while now? Are you tired of searching for a natural remedy for hemorrhoids? Is your baby’s colic giving you sleepless nights? Though none of these situations are related, their solution certainly is! 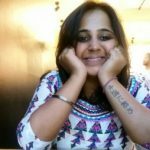 This article is going to tell you all about a one-shot solution for all the above problems – chamomile tea. Chamomile tea is an ancient, herbal remedy for managing a multitude of disorders. And the best part is it can be made in 20 minutes! Scroll down to know why the world is crazy about this simple beverage. What’s So Special About Chamomile Tea? What Are The Potential Benefits Of Drinking Chamomile Tea? 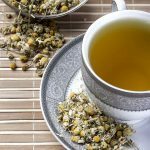 What Are The Side Effects Of Having Chamomile Tea? Chamomile is a member of the beautiful family of daisies (Asteraceae or Compositae). Its pretty and bright face is an add-on. The use of chamomile in human medicine dates back to at least 5000 years. It is one of the safest herbs you can ingest or apply. As much as it tastes heavenly, chamomile tea also heals a horde of health conditions effectively. Chamomile tea has no caffeine and theobromine. Well, there aren’t enough reasons that make chamomile tea special! Chamomile tea is made from dried flowers and sometimes leaves of chamomile. You have two popular varieties of this flower – German Chamomile (Chamomilla recutita) and Roman Chamomile (Chamaemelum nobile). The dried flowers of these species have high amounts of flavonoids, terpenoids, and phenolic compounds. Hence, it has a high therapeutic value (1). Regular and regulated warm cup(s) of chamomile tea can relieve muscle cramps, fever, hemorrhoids, insomnia, and several other issues. I see the ‘how,’ ‘why,’ ‘how much,’ ‘what if,’ ‘why not’ and list of questions popping in your mind. Start reading the following sections to find all the answers! Chamomile contains apigenin, a natural tranquilizer. It binds to the benzodiazepine receptors in your brain, acting as a mild sedative and hypnotic agent (1). In a small-scale study including cardiac patients, 10 of them reportedly fell into deep sleep for 90 minutes after drinking chamomile tea (1). This tea can also be recommended to new mothers to improve sleep quality, fatigue, and depression (2). There are mixed reviews about chamomile tea improving anxiety. German chamomile showed a significant reduction in generalized anxiety disorder (GAD). However, these effects are mild to moderate (1). Diarrhea and colic can be extremely painful and irritating to children as well as parents. Chamomile tea with licorice, vervain, fennel, and mint was administered to 68 children with colic in a study. The dosage was up to 150 ml of this tea, not more than thrice a day. After a week’s treatment, about 57% of the infants showed improvement in colic, as compared to only 26% in the placebo-treated group (1). Another study had 79 children, about 5-5.5 years old, who had diarrhea. These children were given apple pectin and chamomile extract preparation for three days. Diarrhea ended sooner in pectin-chamomile-treated children than their placebo-treated counterparts (1). Chamomile is traditionally used to treat an upset stomach, flatulence, ulcers, and dyspepsia (1). Its tea might also help soothe stomach muscle spasms, aid the passage of food through the GI tract, and prevent hyperacidity. You can brew this tea with licorice root, peppermint leaf, caraway, milk thistle fruit, and lemon balm leaves. Apigenin is one of the abundant functional phytochemicals in chamomile species. This flavonoid, along with apigenin-7-O-glucoside, (Z) and (E)−2-hydroxy-4-methoxycinnamic acid glucosides, can interfere in the activity of starch metabolizing enzymes (3). These polyphenols inhibit α-amylase and maltase activities. These enzymes break down complex polysaccharides (like starch) into glucose and fructose units. When the produced glucose or fructose enters the bloodstream, sudden spikes or dips in the serum levels are observed (3). 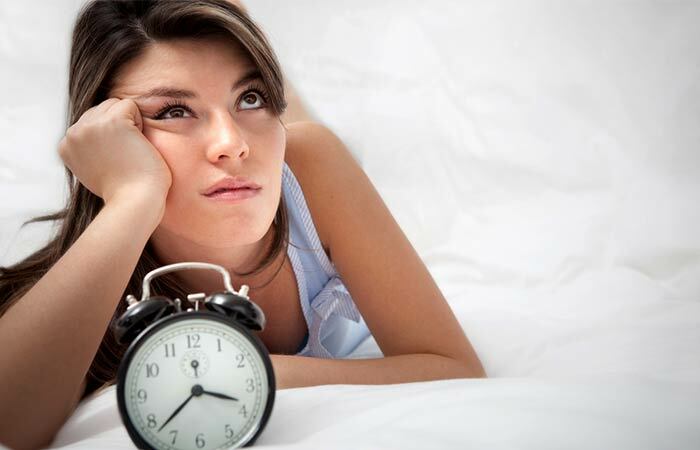 These postprandial (post food) fluctuations can worsen diabetes in humans. Drinking chamomile tea can improve glycemic control and diabetes by modulating carbohydrate metabolism, sugar absorption, glycated hemoglobin (HbA1c) concentration, and the lipid profile (3), (4). 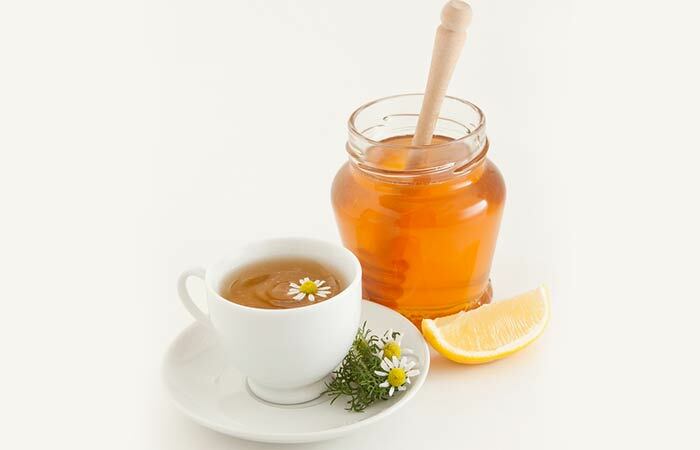 Drinking warm chamomile tea can relieve sore throat, flu, runny nose, and other acute ENT infections (1), (5). Dried chamomile powder can be used as a vulnerary agent to heal wounds, bruises, skin eruptions, shingles, boils, and even hemorrhoids (5). Apply and leave in strongly brewed chamomile tea on your hair after shampooing. The pigments and polyphenols can lighten your hair color and give you homemade, natural highlights! You can also use chamomile tea or extract as a yellow-brown fabric dye (6). Chamomile extracts possess uterine-stimulating and oxytocic effects. Administering these extracts has shown to induce (post-term) labor in pregnant women (7). This calming herb can reduce the stress and anxiety in pregnant women and ease the delivery and prevent perinatal deaths (7). Is your baby facing teething pain? Dip a clean cloth in chamomile tea and freeze it well for a few hours. Let your baby bite on this cold cloth. Their gums might stop hurting..
Due to the diverse flavonoid content, chamomile can heal many inflammatory conditions. These include eczema, rheumatoid pains, ulcers, gout, and neuralgias, GERD, eye inflammation, hemorrhoids, sunburns, and rashes (8). The flavonoids apigenin, luteolin, quercetin, and patuletin, along with terpenoids, α-bisabolol and its oxides, chalmuzene, and acetylene derivatives are said to be responsible for this anti-inflammatory activity (8). This medicinal herb extract can inhibit proinflammatory nitric oxide production in your body. Moreover, chamomile downregulates the gene expression involved in producing intermediates like prostaglandins. It also blocks the activation of various immune system cell types that can aggravate inflammation (8), (1). To experience maximum relief, you have to make it a habit of drinking this tea regularly. The micronutrients and phytochemicals present in it can make all the difference. Don’t you want to know what’s in that cup of chamomile tea? Most of the above benefits are attributed to the biochemical profile of the chamomile flower. In fact, chamomile teas have 10–15% of the essential oil available in the ﬂower (9). Roman chamomile has about 0.6% of sesquiterpene lactones (germacranolide type) – e.g., nobilin and 3-epinobilin. Glycosides, hydroxycoumarins, flavonoids, coumarins, terpenoids, and mucilage are a few classes of complex biochemicals (1). Out of the flavonoids, fair amounts of apigenin, luteolin, kaempferol, rutin, isorhamnetin, quercetin, patuletin were identified in the flower. Herniarin and umbelliferone are abundant among the coumarins (1), (10). 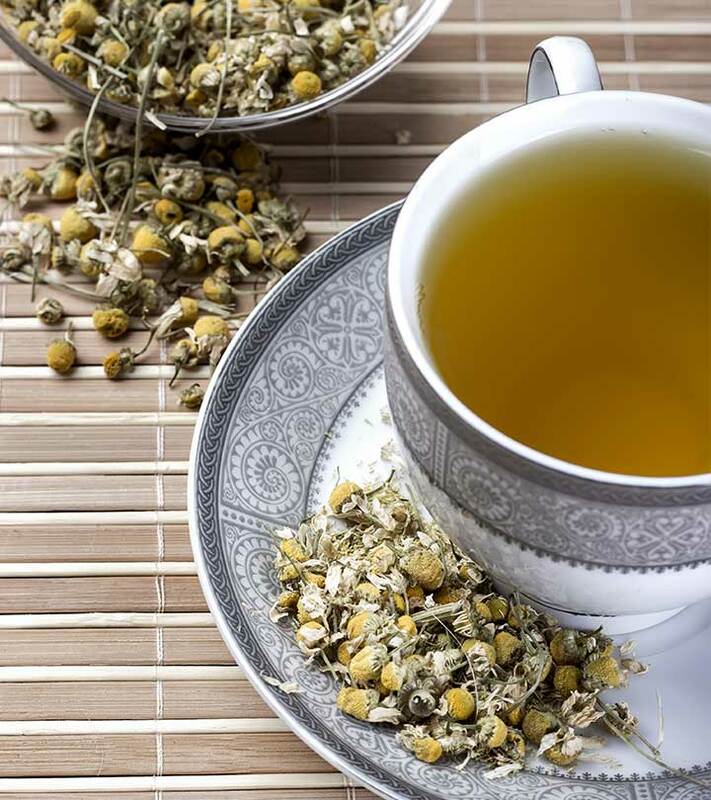 The total polyphenol and total flavonol contents in commercial chamomile teas from different countries were found to be between 13.2 to 17.6 % and 0.39 to 1.21% (w/w) chlorogenic acid equivalent, respectively (10). These figures could vary depending on the geographical origin, drying condition, environment, cultivation, pick time, plant organ, extraction procedure, chemicals used to extract, etc. (10). Now you know what chamomile tea contains. You also know why should you drink it and what makes it special with those benefits. It’s time to address the most important question – how do you make chamomile tea? Add the dried chamomile flowers (Buy Here!) to hot water. You can also try the readily available chamomile tea bags (Buy Here!) for this step. Let it infuse and steep for 2 to 3 minutes. Strain into cups. (Not necessary if you are using a tea bag. )You can add lemon and honey as per your taste (optional). Serve hot!Here’s a bonus tip! You can add different essences or whole ingredients like hibiscus flowers, spearmint, vanilla, licorice root (extract), orange zest, rose petals, apple slices, lemon wedges, etc. These elements take your not-so-interesting chamomile tea to the next level. With all these add-ons, you might as well drink up a pitcher full of chamomile tea all day. Wouldn’t the results be amazing? Before you even attempt the pitcher-dare, read the following section. Like most herbal teas, chamomile tea also comes with its share of risks and side effects (11). If you are allergic to daisies or any member of the Asteraceae or Compositae family, it is better to avoid this tea. If you experience skin rashes, respiratory difficulties, or any hypersensitivity, consult your doctor and inform about the tea intake. Pregnant women are recommended to stay away from herbal teas because a few herbs, like chamomile, might have uterine stimulating properties and could induce preterm labor and other complications. Another hiccup could be the blood thinning property of chamomile. If you are already on blood thinners, it is better to avoid this tea. However, there aren’t any documented life-threatening effects of chamomile tea overdose. Chamomile is listed on the FDA’s GRAS (generally recognized as safe) list of foods too! So, having several cups of chamomile tea in a day might not do a lot of harm. There is no strict dosage range mentioned for this herbal beverage too. Further research might help us watch our tea intake. Chamomile tea is one of the world’s oldest and popular therapeutic beverages. Drinking regulated doses of this caffeine-free tea might relieve inflammation, gastric troubles, diabetes, obesity, hypersensitivity, skin issues, common cold, sore throat… and the list is endless! This tea is also very simple to make. Steeping it in hot water for about 5-10 minutes could give the best results. But, keep in mind its side effects. We suggest you consult your doctor/nutritionist to frame the right dosage for you. Try brewing a small batch of chamomile tea. Tell us how that first sip of warm tea felt. Share your experiences, recipes, suggestions, queries, and feedback in the section below. “Chamomile: A herbal medicine of the past with bright future” Author manuscript, US National Library of Medicine. “Effects of an intervention with drinking chamomile tea on…” Journal of Advanced Nursing, US National Library of Medicine. “Acute metabolic actions of the major polyphenols…” Scientific Reports, US National Library of Medicine. “Effectiveness of chamomile tea on glycemic control…” Journal of Endocrinological Investigation, US National Library of Medicine. “Chamomile (Matricaria chamomilla L.): An overview” Pharmacognosy Review, US National Library of Medicine. “German Chamomile (Matricaria Recutita)” Heritage Garden, University of Illinois at Chicago. “Onset of Labor in Post-Term Pregnancy by Chamomile” Iranian Red Crescent Medical Journal, US National Library of Medicine. “Chamomile, an anti-inflammatory agent inhibits inducible…” Author manuscript, HHS Public Access, US National Library of Medicine. “Correlation among environmental factors, chemical…” Industrial Crops and Products, Elsevier, Academia. “Analysis of phenolic compounds in Matricaria chamomilla…” Research in Pharmaceutical Sciences, US National Library of Medicine. “Review on Herbal Teas” Journal of Pharmaceutical Sciences.